Following my last post where the origin of xylonite was [briefly] explained : here’s my second collection. The brush and penknife have jumped in from the last post; but are now shown with a cut-throat razor and hand-held mirror. As noted in the last post, xylonite deteriorates with time and exposure to direct sunlight. 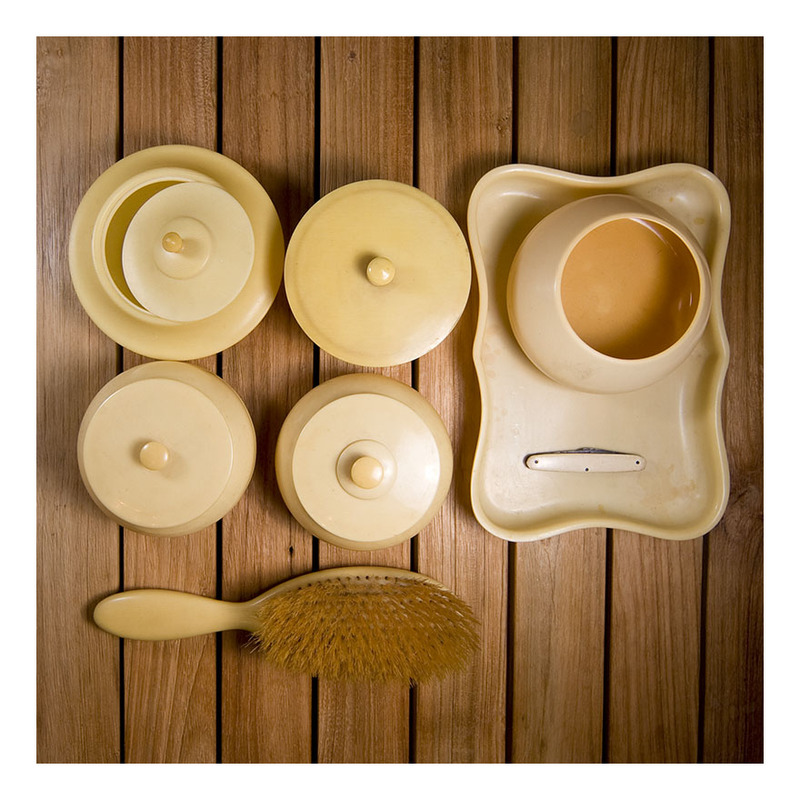 These pieces are in fantastic condition for their age [and careful storage away from the Australian sun.] The piano box is particularly pristine. Here we have a delightful candle holder made in the 1920s. It came from an Estate sale where I met and got chatting to the grand-daughter of the original owner. She knew the candle holder was from the 20s because her grandmother had talked with much affection about its purchase- and long use since then. The candle holder is unmarked- not uncommon for pottery pieces produced just after the war- but the green glaze and the stylistic influences are classic Art Deco. As is the integral handle- made from the upsweep of the base- all very modern in the 20s and anticipating the modernism of the 50s. 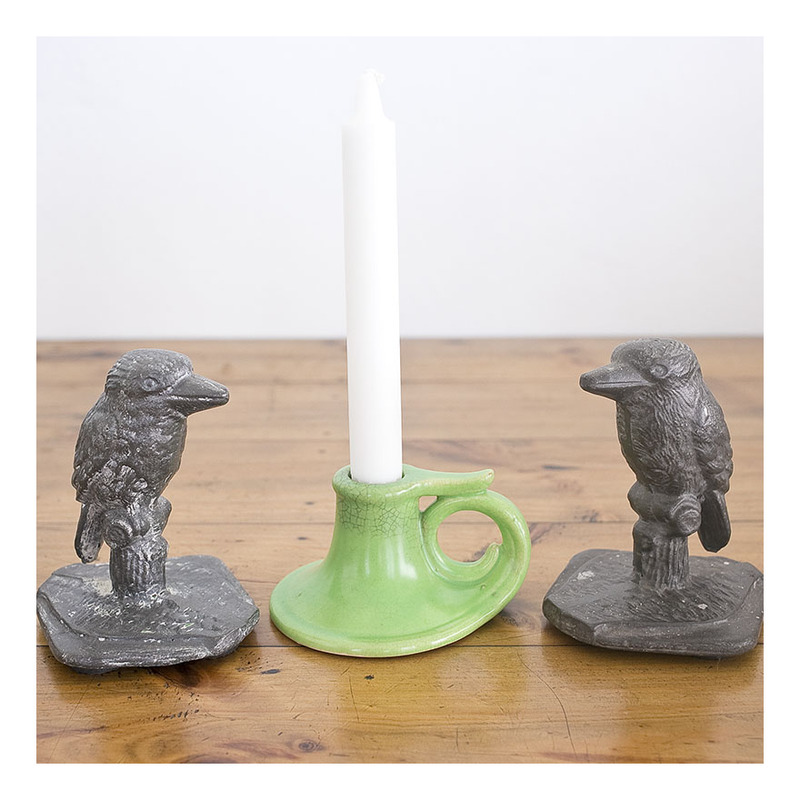 I have teamed the candle holder with a pair of 20s cast iron kookaburras from my partner’s collection [you will recall she is exceptionally fond of kookaburras.] Although they are of the same era, the kookaburras look crude next to the sleek modernism of the candle holder. At the turn of the century, Manto Ware pottery started producing work that mimicked Royal Winton; here we have an example- very English looking toast racks, textured ceramic for a ‘naturalistic’ look and topped by an acorn. These were made for the export market- for Australia and New Zealand- markets that wanted Royal Winton but couldn’t afford the price- or the time- for the products to arrive. Manto Ware stepped in to fill the breach. Silver plate toast racks are good too- see my recent post of a 1920s EPSN toast rack.